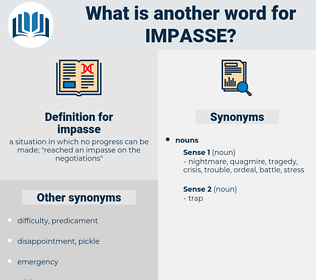 What is another word for impasse? 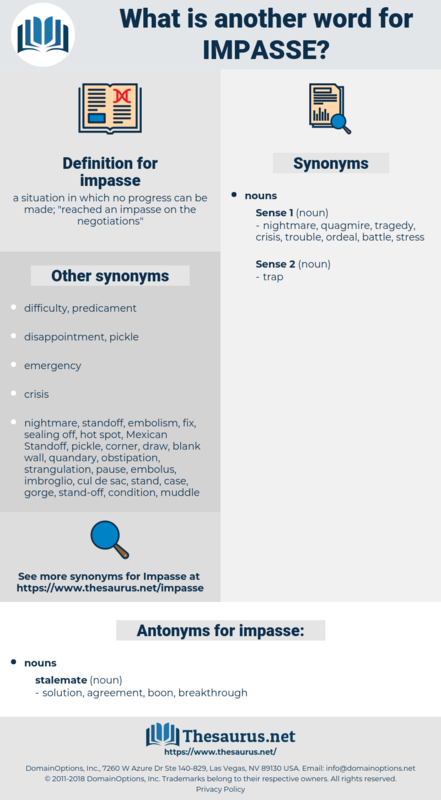 a situation in which no progress can be made; " reached an impasse on the negotiations"
standstill, situation, crossroads, breakthrough, plight, quandary, slump, mess. logjam, stagnation, gridlock, predicament, quagmire, paralysis, alley, rut, stillness, blockage, blockade, treadmill, neutral, morass. Provided she were left the hovel in the Impasse Saint - Mittre, Adelaide would have sold all Plassans. He crept stealthily to the end of the Impasse Saint - Mittre.